Here is a machine tending application very interesting and it can helps you figure out the right setup for your own application. The door don't need to be automated as the robot can close it itself. If more than one setup for 1 part, you can have jigs inside the CNC to help with the manipulation. Notice that the final position of the part is set by a tool on the CNC turret. This way you don't need to use external signal to call the closing of the chuck. 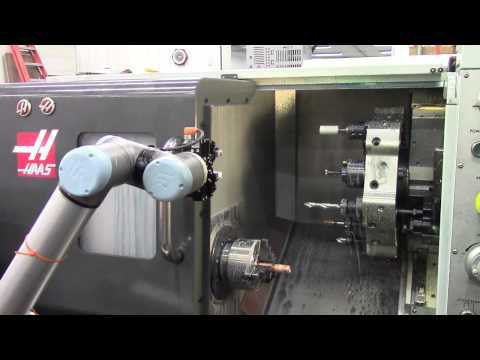 Notice also the use of custom fingertips on the Robotiq gripper.